"Grbl has not finished booting." Toolbars or Windows don't appear. Check the baud rate is 115200, or 9600 for very old versions of grbl. Make sure you are connecting to the correct port. Make sure you have installed any drivers required for your controller. Make sure GRBL is properly flashed on your controller. The UGS Parser has a configurable list of rules to skip certain patterns, these rules are typically added by a Yes/No dialog asking if you would like to skip the erroneous commands in the future. Sometimes GRBL will get into an ALARM state and there will be lots of these popups which should not be skipped in the future. 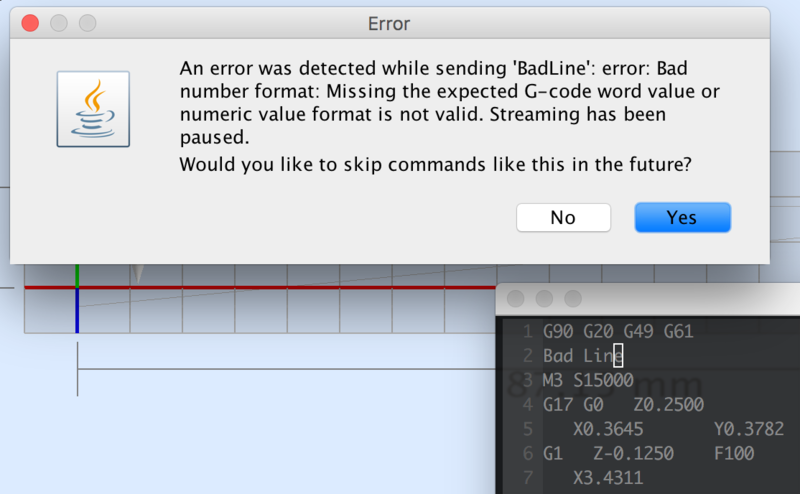 Skipping good commands may lead to broken gcode. Those rules should be removed from the gcode processor by going into the controller options. 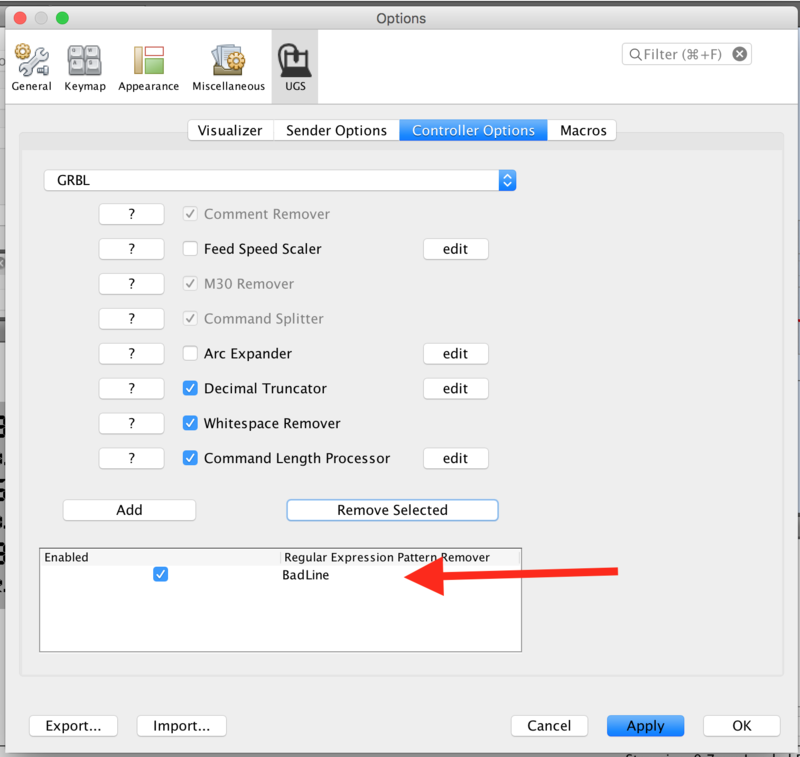 In UGS Classic the option is in Settings > Gcode Processor Configuration. In UGS Platform the option is under Preferences... > UGS > Controller Options. This usually happens if you try running the platform without the required version of Java. The user cache is initialized but some objects become corrupt and initialization fails in the future even after upgrading Java. This can be fixed by clearing out the user cache directory which can be found on the UGS "About" screen seen in the image below. Occasionally it is useful to attach some of these property files to bug reports to help with reproducing a problem. Files include UniversalGcodeSender.json which contain different settings, and a firmware_config directory which contains several configurations for different firmwares and testing profiles. 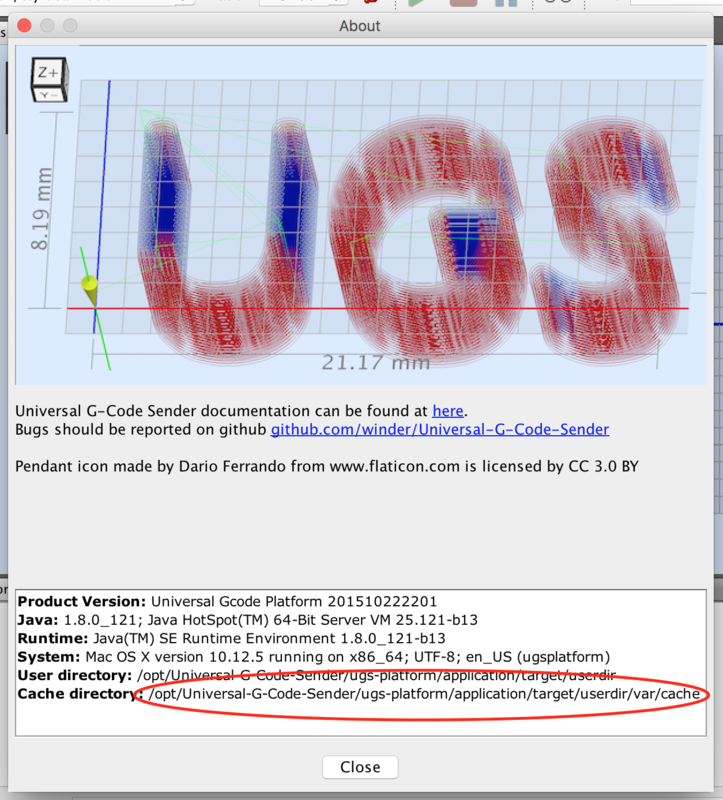 The platform version of UGS contains additional property files automatically created by the NetBeans Platform framework being used. These files are also contained in various locations based on the operating system being used. You can find the exact locations of these files in the About / Help menu (See screenshot above). It is sometimes necessary to clear out these properties between major feature updates. There are a number of window managers which are "non reparenting", this causes some problems with Java. Some details about this problem can be seen here. Check the controller settings, and make sure "Arc Expander" is not enabled. This can take a small program and turn it into a very large one by converting arcs into many small movements. Increase the memory allocated to UGS by navigating the the intsallation directory (See paths above). There is a folder named etc containing ugsplatform.conf, open this file with a simple text editor and modify the value of Xms to something like -J-Xms256m, or larger. Additional details can be found here.